Would you believe come January BOOM! Studios Stan-Lee-verse will have been going strong for four straight months? Add to that the 28 Days, Farscape and Disney titles and you have a pretty solid line-up. These two covers the ones that stepped forward as best of the bunch. 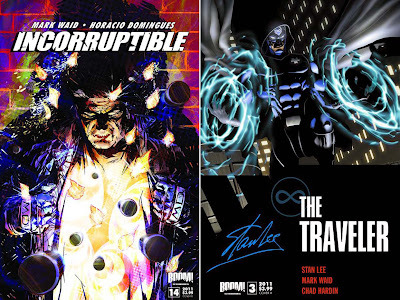 ARTIST AND TITLE: GERRY BROWN - Incorruptible #14, and SCOTT CLARK - Stan Lee's The Traveler. Get more BOOM! after the jump.